You may find one foot is longer than the other, this is quite normal, please use the larger size when making your shoe size selection. If your foot measurement is halfway between sizes, select the larger size. 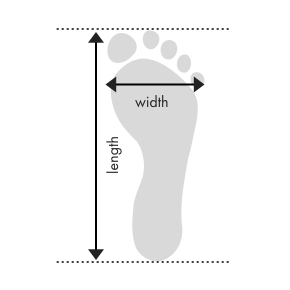 1Measure your foot length by placing a ruler flat on the floor straight alongside the inside of your foot from your heel to your toes. 2Place an object with a flat edge straight across your toes with the edge touching the tip of your longest toe. Take the measurement (in millimeters) from the ruler where the flat edge crosses (see image above). This is your foot length measurement.